Whatever mistakes Mary Barra may have made dealing with her own massive recall crisis, no one can say she hasn't shown up. Even when I haven't liked the answers she's given, she's been willing to sit down and hear the questions. I think it's one reason why people haven't entirely written her off as a leader of General Motors. 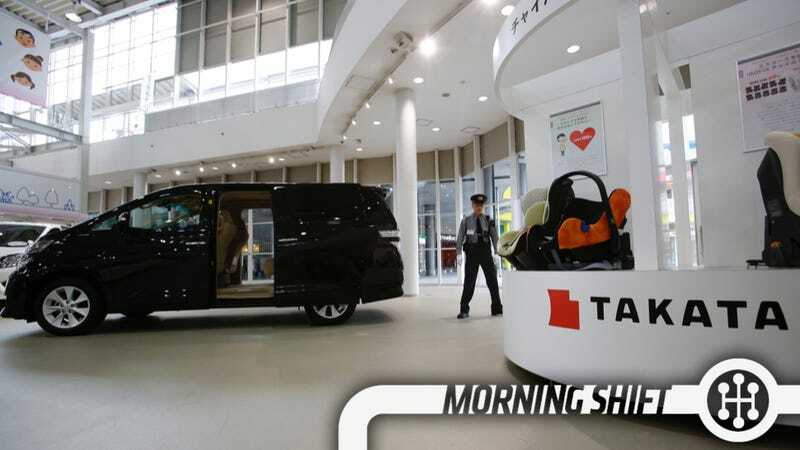 The same can't be said for Takata CEO and Chairman Shigehisa Takada, head of the airbag supplier at the center of a massive global recall that includes all the hallmarks of the GM crisis: Tragic deaths, signs of a coverup, loss of public confidence. Takada plans to skip Thursday’s analyst briefing in Tokyo and send in his place Chief Financial Officer Yoichiro Nomura, who also appeared at the Tokyo Stock Exchange last week to bow in apology for the company. The last public showing by the head of the maker of air bags linked to four deaths was in June, at an annual shareholders’ meeting closed to the media. Since then, his only statement was issued seven days after the U.S. urged immediate fixes to cars recalled because of Takata products. Because it's the year of the recall, here's a trio of reports from Businessweek from separate companies with similar issues. NHTSA is probing two similar complaints from EX35 owners who said their steering gave out on them at low speeds, with the steering column eventually coming apart. Mercedes had a similar issue which led to the recall of about 11,000 new Mercedes C-Classes. Finally, NHTSA is looking at complaints from Honda Accord owners of a similar issue which, if serious enough for a recall, would be a big deal. They sell a lot of Accords. 3rd Gear: How GM Wants To Turn It Around There's an interesting Q&A with GM's Dan Ammann in the WSJ. We don't hear his name as often as we do Mark Reuss (he seems less boisterous), but he's nevertheless an important deputy to Mary Barra. WSJ: So what is the new strategy? Mr. Ammann: We as an industry have been good at saying ‘the customer is looking for this, this and this.’ The much harder discussion tends to be, ‘they really don’t need this, this and that.’ If I can take out things customers in different markets aren’t looking for—for example, not everyone wants assisted driving or navigation technologies—I can take the money saved there and use it to enhance design. An example would be heated seats are a must in Russia but way less important in the Middle East. While I'm against de-contenting where it's harmful to the brand (ahem Jetta), I'm not against making strategic decisions. While the first F-150s rolled off the assembly lines yesterday, it's not as if they can magically meet the projected demand for trucks up in a day. It's going to take a while. Per Automotive News, it's going to take until sometime in the second quarter of the year for everyone to be fully stocked, but that F-150s will start arriving in dealerships next month with retail deliveries early next year. Sponsorship of news programming isn't anything new and, in fact, it's almost a given now. The NYT says Volkswagen will continue that trend by sponsoring a series of CNN documentaries including one on the value of college and a movie about critic Roger Ebert (Oh, that sounds good). The sponsorship will be promoted in video clips and posters using phrases like “CNN Films, presented by VW,” rather than giving Volkswagen a shout-out in the title the way that, say, “Camel News Caravan” did for Camel cigarettes or that, in the contemporary sports realm, a college football championship game was renamed the Goodyear Cotton Bowl Classic. Just hearing about the "Camel News Caravan" does make me think that Parliament should pay for a news program that covers the British government. On this day in 1965, brothers Bill and Bob Summers set a world land-speed record—409.277 miles per hour—on the Bonneville Salt Flats in Utah. They did it in an amazing, hemi-powered hot rod they called the Goldenrod. (The car got its name from the '57 Chevy gold paint the brothers used.) Today, the Goldenrod is on display at the Henry Ford Museum in Dearborn, Michigan. Neutral: Can You Think Of Worse CEO Behavior? This Takada guy seems to take the cake.